At the Sixth International Marine Debris Conference in San Diego, California, U.S.-based members of the global movement, #breakfreefromplastic, including Plastic Pollution Coalition, rallied in front of the venue with a 12-foot banner screening the message, "to stop plastic pollution, stop making plastic." The group called for an end to single-use plastic products, which are used for minutes and persist in the environment forever. Members of the movement said industry's response to the plastic problem is to downgrade it to merely a waste management issue, and put the onus on municipalities and citizens to bear the cost of dealing with the plastic pollution that plastic producers and consumer brands create. Attempts to soften the realities of plastic pollution by relabelling it "marine debris" misleads the public-- plastic is not a waste management issue. Without significantly reducing the amount of plastic produced, we cannot hope to solve the issue of marine plastic pollution. "We know, from picking up the trash off of our beaches and out of the coastal waters, that this problem is not a waste management issue that requires 'end of pipe' solutions, but that the problem of plastic pollution starts with the materials that are used and the single-use approach to product packaging and food service. We have to move away from single-use plastic," said Angela Howe, Esq. Legal Director for Surfrider Foundation. According to a recent report by the Center for International Environmental Law, based on investments in petrochemical infrastructure, plastic production is slated to increase by 40% in the coming decade. In the U.S. alone, 264 new plastics-related facilities and expansions are currently planned, stemming from the shale fracking boom. Without significant intervention, the plastic the amount of plastic on the planet will quadruple by 2050, and no waste management system will be able to contain the ensuing pollution. To date, only 9% of plastic ever created has been recycled. "Single-use plastic pollutes throughout its life cycle, beginning with extraction and refining and ending up in our waterways and oceans,” said Kate Melges of Greenpeace. "We know that low-income communities, particularly communities of color, disproportionately face the impacts of corporate polluters' quest for cheap and convenient products. companies must reduce throwaway plastic immediately for our oceans and our communities." 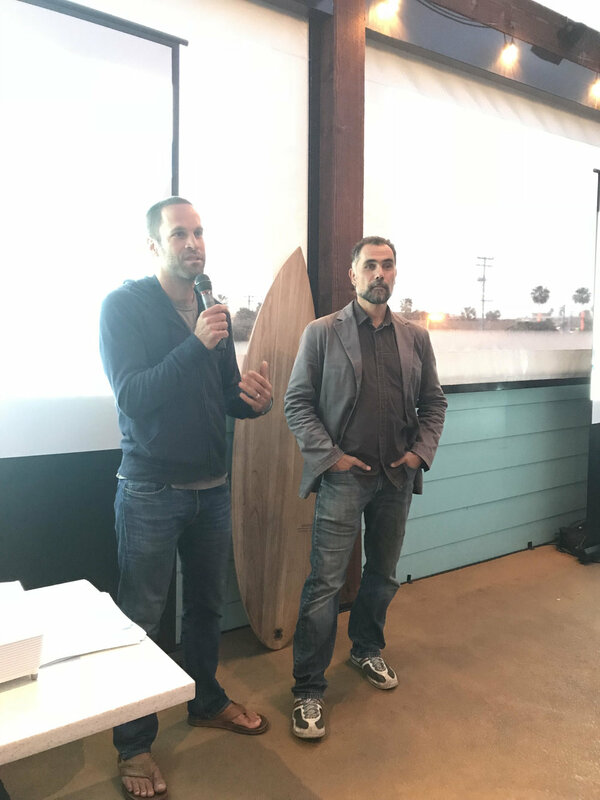 PPC Notable Member Jack Johnson and 5Gyres' Marcus Eriksen at the conference's 'Smog of the Sea' film screening. Bharati Chaturvedi of the Chintan Environmental Research & Action Group (New Delhi, India) speaks on the Environmental Justice panel. 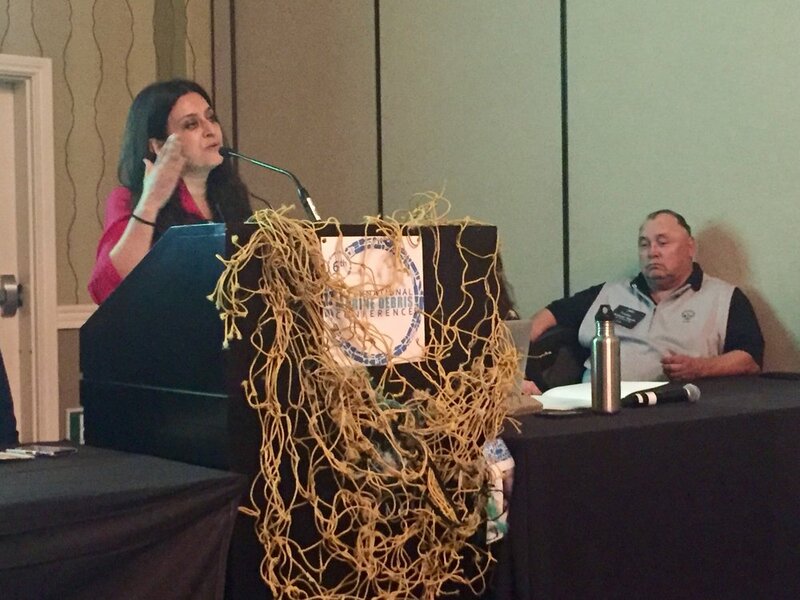 Rosa Rivera Furumoto of California State University & Parent Pioneers (Northridge, CA) speaks on the need for healthy communities on the Environmental Justice panel. Irma Muñoz of Mujeres de la Tierra (Los Angeles, CA) speaks on the need to organize and heal Mother Earth. The conference featured reusable steel cups. Jane Patton, Managing Director of Plastic Pollution Coalition, moderated the Environmental Justice panel. "Ending the 'throwaway' culture has co-benefits of reducing climate change impacts caused by oil and gas extraction, plastics production, and incinerating plastic waste," said Miriam Gordon of Upstream Policy. "In addition, cutting consumption of plastics reduces our exposure to cancer-causing, hormone-disrupting plasticizers that leach from packaging into food and beverages." Instead of heeding international calls for less plastic in the marketplace, the plastic industry is instead pushing false solutions like plastic burning. "The plastic industry tends to champion such schemes as 'waste-to-energy,' gasification, and pyrolysis as solutions to the plastic problem," said Monica Wilson, Research Director at GAIA. "These methods require ongoing extraction of resources as they fail to keep valuable materials in a circular economy, and they have been known to create harmful emissions like heavy metals, persistent organic pollutants, and greenhouse gases. Far from solving the problem, burning plastic creates new ones." 6IMDC included plenary talks from leaders in the plastic pollution sphere from more than 50 different countries. For the first time, the conference included a panel discussion on Environmental Justice where participants discussed the need to work with communities of color across the world on the issue of plastic pollution. In another panel, Plastic Pollution Coalition gave a preview of a global toolkit on legislation to reduce plastic pollution, created in collaboration with Coalition members. During the closing plenary, musician and activist Jack Johnson, a PPC notable member, said he wanted people to take away a positive message. "My main goal is to write love songs-- sometimes to make people fall in love with each other, sometimes to make them fall in love with the ocean." Organizations who are part of the Break Free From Plastic movement represent a global community of advocates and stakeholders working in solidarity to stop plastic pollution at all points in the system, from extraction to disposal.